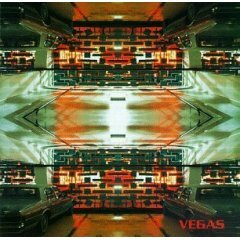 I was tempted to select ‘Vapor Trail’ from Vegas, The Crystal Method’s debut album, as the first track to write about in this continuing series. Both are excellent examples of meticulously orchestrated electronic music, but ‘High Roller’ gets the nod because it’s a little bit more innovative. If you know the album but not the track names, this is the one which has “This transmission’s coming to you / We’ve got it” running all the way through. The track opens with straightforward pumping synth which slowly becomes more complex as the samples are laid over the top. After about a minute, the thumping bigbeat comes in, and more synth elements are gradually added. Kirkland and Jordan understand, however, that simply adding elements can make a track work okay, but to make it really interesting, you’ve got to strip some of those elements away in turn. So, the track ends up as about four minutes of all these different keyboard, drum and other percussion elements, along with the distinctive samples, being cut in and out at various intervals in a way that flows beautifully and demands attention. I was reading just now and this track came on, and I had to stop and listen (and write about it). I seem to read a lot of unimpressed reviews of electronic music which complain that ‘you couldn’t dance to it’. In this case, and most of the others, it isn’t supposed to be about dancing. Best appreciated through headphones, this is a challenging, professional bit of work. And the beat sure kicks arse.